How Green Is Our Spa? Soothing music welcomes you to bring your stress level down a notch or two as soon as you step through the door. The design of Zenergize was carried out by Earth-Gentle Interiors utilizing LEED sustainability guidelines. 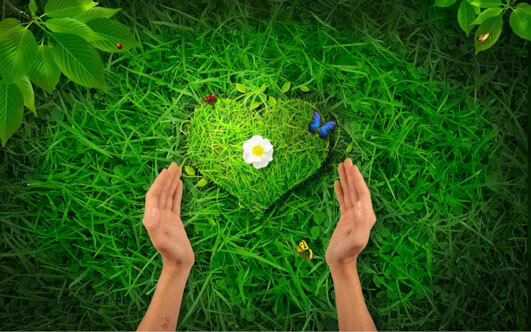 Utmost attention was given to every detail - both for your health and our planet's. We were Green before Green was cool! 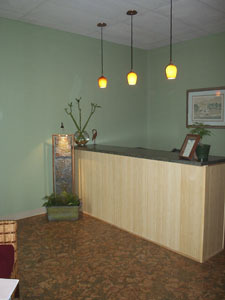 The cornerstone design feature at Zenergize is the reception area's handsome green burl cork flooring. Natural cork is found throughout the rest of the facility. We clean it with organic linseed oil soap, so Zenergize is free from harmful chemicals and offensive odors. The restful sage green of the walls is just as restful to your lungs and nervous system as to your eye. We use zero-VOC paints throughout. The bamboo veneer on the reception desk is a sustainable, quickly regenerating resource. No paper ever touches your skin, as we use soft cotton jersey covers for our fleece-covered face cradles. We use top-of-the-line baking soda air filters in our ventilation system to keep the air in our spa pure and clean - free of dust, odors or fumes. Natural jute window shades were repurposed to create unique fixed window treatments in the Reception and Photo Facial treatment rooms. The pedestal base for our artisan-made coffee table was created with waste bamboo from the reception desk and recycled beach glass. Our ultra-high efficiency laundry pair uses 60% less water and energy and cleanses our linens better than a top-loader. The cachet of our European-style toilet is not for style. It provides a high-efficiency flush at a low volume. The striking glass vessel sink with pedestal faucet have been incorporated onto a repurposed antique oak table. Absolute cleanliness is maintained using the least-toxic alternatives available. Organic cleaners are used whenever possible. We use only hypoallergenic massage cream. Our massage cream contains arnica, which aids circulation and dissipates bruising. You are offered a glass of filtered water after your massage to flush out the toxins released by your therapy. Our linens are washed in detergent that is free of fragrance, dye, and phosphorus, keeping harmful chemicals out of our water systems. Rugs are cleaned with a high-efficiency HEPA-filtered vacuum cleaner. Floors are sanitized with a steam cleaner.